Cathy2 wrote: Il Mulino in Highwood has filled canolli on display. When you order one, it never comes from the display. The counter person goes to the rear to fill them. Whereas when I order lemon knot cookies, then those are taken directly from the case in front of me. Thanks. Based on this description, I've probably been to places that fill cannoli to order, but just wasn't aware of it, since I don't usually buy cannoli. Heck, even if I did, I might not notice whether any item is taken from the display case or is prepped behind the counter, except at a place like Pasticceria Natalina where "behind the counter" is all out the open where you get to watch the baked products being made. nsxtasy wrote: Here's a question: In the places where they fill cannoli to order, how do you know that they're available and that they're filled to order? Do they put empty cannoli shells on display? Or do they put a filled one on display, but fill the ones you buy at the time you buy them? They do both. For example, as mentioned upthread, Pasticceria Natalina sometimes has cannoli on display but fills to order, the display cannoli are simply display. Where as Allegretti's has empty cannoli shells on display and fills to order. What I'm used to from back home is that you'd go to an Italian bakery and you'd know that they have cannoli and you wouldn't even consider the possibility that they'd be pre-filled. I don't think the shells were even on display -- people would just ask for cannoli. There'd usually be this gigantic pastry bag full of the ricotta filling hanging on a hook and when you ordered, a 90-year-old lady* would grab some shells and pipe in the filling. Repeated requests to plant one's mouth underneath the pastry bag were invariably unmet, but hope springs eternal. *I am deeply suspicious of Pasticceria Natalina, as the lady in the above photos looks to be considerably younger than 90. Many thanks to Gypsy Boy for posting and calling our attention to Pasticceria Natalina and also to m'th'su, who had also alerted me about this place's opening. Amata, Lucantonius and I made a trip up to the far northern reaches of the world on Sunday morning with two destinations in mind, one of which was Pasticceria Natalina and the other of which turned out now to be closed on Sunday's. PN was, of course, open and there working away on zeppole for Saint Joseph's day were the owners and a third person. As a number of people have said above, these folks are very friendly and from all appearances clearly seriously committed to turning out high quality products. The item I was most interested in trying at PN were the cannoli but to my considerable chagrin they had no shells on hand and we were told it would be some 30-40 minutes until the next batch would be ready. I'll definitely try to get back there some time in the more or less near future to try them but will perhaps call to make sure they'll be available at the right moment. Compensating for the disappointment on the cannoli front was the availabilty of some very nice arancine; I was especially happy to hear that these were meatless, since -- this being Lent -- I was thus able to buy a few and consume one during the week. 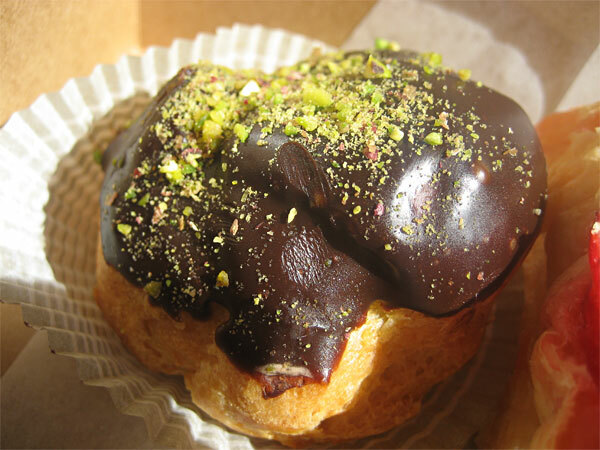 I noticed that, as indicated would be so above by Mike G, they had some sfogliatelle on hand, displayed in the counter case, and to take the place of the cannoli scappati, we bought a couple of these. Now, sfogliatelle are a Neapolitan and not a Sicilian specialty and I really wanted to try on this my first visit items that would be the real specialties of Natalie and her Palermitana family, but with my first choice unavailable, I was seduced by the little clam-shaped pastries (sorry, no photos, as they were consumed in a state of post-prandial relaxation). 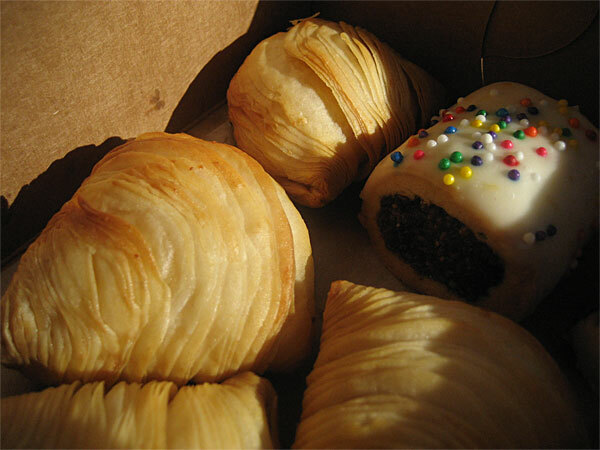 In any event, the sfogliatelle were quite good, in the context of Chicago, where there is a serious dearth of good pasticcerie, very good indeed. Now, growing up in a Neapolitan family (Groß-Neapel, jedenfalls), I've been eating sfogliatelle since earliest childhood and these were not to my mind at the level of the ones I've had in Campania or from the top pasticcerie in New Netherland (d.w.z., New York/New Jersey), but definitely superior to others I can recall having in recent years around here and in a basic sense, good stuff. I also like the fact that they offer two different sizes, the mini-version striking me as perfect for offering after a big holiday meal or when there are other items offered for dessert as well. I'm very happy that Pasticceria Natalina has opened and wish them great success. Though they are located in a place rather far from where we live, we will make a point of getting up there and trying many of their offerings. It seems important too to note that they have only been open a short time and will almost certainly get better as kinks are ironed out and a full routine is established. One qualm I have concerns the prices: I certainly recognise that the top ingredients and small-scale of operations demand higher prices than one sees at most other pastry shops but I would hope that they don't end up a place that average folks can afford to visit at best only once or twice a year. But again, my basic reaction to the opening of PN and to my first chance to sample their wares is one of considerable happiness; I'm very much looking forward to returning and trying other items and seeing their progress, as they establish themselves. Haven't tasted them, don't have a wide base for comparison, but looking forward to them at long last, just because they've been in the back of my head since a discussion of them here, long ago. What I also like about P.N. at this early stage is that there's new stuff every time I go there. Today there were baba au rhum-type things, mango custard puff pastries, very nice looking foccaccia, and a much wider variety of the savory puff pastry triangles, to name a few. I stopped by Pasticceria Natalina on Sunday, and was very charmed by the beautiful bakery. Usually puff pastry really doesn't appeal to me, though I do enjoy other flaky pastries like pie crusts made with shortening, well made crossants etc. Eating the Nutella puff pastry and a proscuitto, peas and mint puff pastry changed my mind. I thought I hated puff pastry, but it turns out that I had just never had puff pastry made by Natalie (or Nick) before. The buttery light layers were perfectly accented by the sweet hazelnut and the savory minty concoction (separately, of course). Even the tips of the triangles, that didn't have a filling were delicious, and not dry at all. 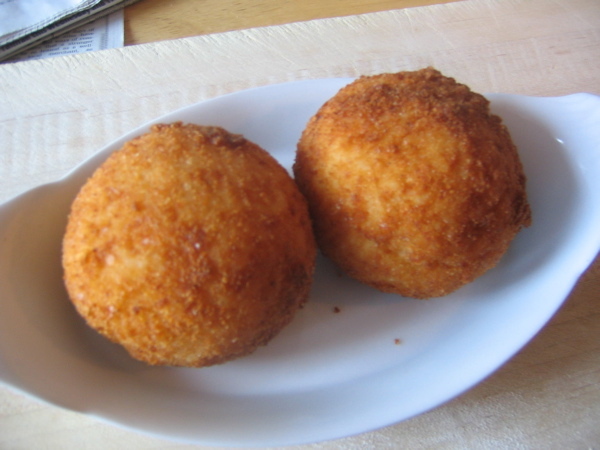 The owners are very cute and were playfully joking that the reason Natalie got Nick to marry her was because of her arancine. I will be back to try their pizelles (phoning first to ensure that they will be baking them that day). Antonius wrote: One qualm I have concerns the prices: I certainly recognise that the top ingredients and small-scale of operations demand higher prices than one sees at most other pastry shops but I would hope that they don't end up a place that average folks can afford to visit at best only once or twice a year. A, I share that concern. For four pastries and a pound of cookies, I shelled out close to $40. The cookies were great, but the pastries...well, they were okay. The lemon tarts were close to bitter, and one of the puff pastries seemed to being nothing more than a flakey crust squirted with decent quality chocolate. It is of note that they closed yesterday at noon (reopening at 4:00) because they sold out of everything they had made for the day. Perhaps the somewhat less than stellar quality of the pastries was because they were rushed. Note to Sula; overheard in line: "This must be because of the Reader article, don't you think?" I'd like to add my tribute to Natalie and Nick's hospitality, as they really went above and beyond for me and my friends without a second thought. A couple of Chicago expatriates came visiting this week, and we were making our way to Taste of Heaven for some dessert around 930PM, when I spied the new green awning across Clark St. My GF and I exclaimed, "Oh yeah, we've wanted to come here! But they can't be open this late...no harm in checking, though." Lo and behold, the lights were on, and while their sign listed closing time as 9PM Natalie and Nick were still there, letting their last customer out (or she might have been the cleaning lady ). So we just waved to them, cursing our poor timing, but Natalie shouted "Come on in!" So we traipsed across their freshly mopped floor (we really have no shame, I'm sorry to say), and bought selections from the remnants of the day while profusely thanking her for such hospitality. She sold us bignes at half price along with an assortment of delightful treats, chatting us up all the while, laughing at our lousy jokes, no sign of it being the end of what was likely a 16 hour day for her. Labours of love always get me. Not everything we bought was a winner (the rosewater rice pudding was so cloying it tasted like a product sample from Crabtree & Evelyn), but the most of our haul was so good and they were so nice, I will definitely seek them out at every opportunity for indulgence. Anybody know where I can buy rainbow cookies in Chicago? Keep in mind that their focus is Sicilian pastries. bsmooth7, you should really try this place before you make a statement like that. Sure they don't have your rainbow cookies but that doesn't make them any less Italian. By your account, Il Giardino Del Dolce on Harlem Avenue is not an authentic Italian bakery either and you would be hard pressed to find anyone who didn't think this place is the real deal. It's also worth noting that Pasticceria Natalina has various kinds of almond paste based cookies, and I think they told me they use expensive almond paste they import from Italy. They're quite good, too. Again, not the same as rainbow cookies, but (a) they're good if you enjoy almond paste based pastries, and (b) they might be willing to make rainbow cookies (or something similar) if you discuss it with them. Myopic viewpoints are part of what keep LTH interesting. Just finished an orange marmalade tartlet from Pasticceria Natalina. First bite was normal size, though as soon as taste, texture intensity registered I actually stopped mid-chew to savor the experience. Each subsequent bite was progressively smaller and smaller in an attempt to extend the experience. No sfogliatelle this afternoon, they'll be on hand tomorrow morning. Natalie mentioned she expects sfogliatelle will sell out fast. G Wiv wrote: No sfogliatelle this afternoon, they'll be on hand tomorrow morning. Natalie mentioned she expects sfogliatelle will sell out fast. ..and with good reason. I had the good fortune of tasting one last weekend and it was impressively well-made, tender and flavorful. If anyone has a chance to taste their pine nut coffee cake, please do. 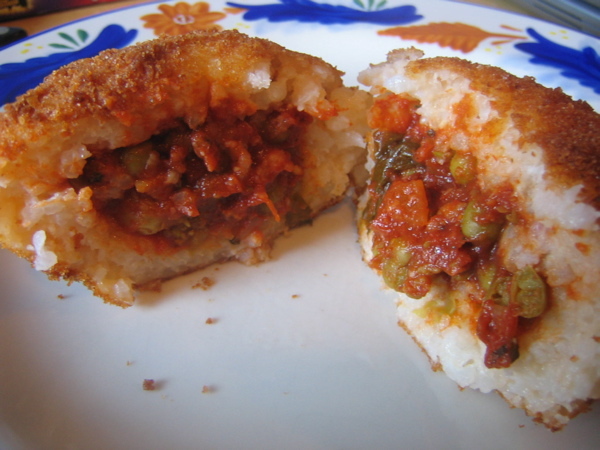 It is excellent: a crunchy exterior and a moist interior fragrant with lemon and pine nuts. Quite a pleasure. G Wiv wrote: Natalie mentioned she expects sfogliatelle will sell out fast. Not willing to take a chance I called Pasticceria Natalina at 8:55 and reserved a few sfoglitelle, there were still 4 sfogliatelle left at 10:30am. Though I had built them up to an almost impossible height of deliciousness they exceeded my expectations. Pasticceria Natalina's sfogliatelle were the highlight of a highlight reel lunch. Fresh fava, smoked shrimp from Calumet Fisheries, Graziano's pecorino pepato and Pasticceria Natalina sfogliatelle. So I stopped by again this week and tried out the sfogliatelle. I am probably the reason why they sold out so fast -- and I have long forgotten about rainbow cookies, that's for sure! Does anyone know if the 11am opening time for Sundays still stands? MKHesq wrote: Does anyone know if the 11am opening time for Sundays still stands? I was there 2-3 weeks ago on a Sunday, and this seemed to be the case. There was no posting. I stood outside for a few minutes trying not to look like an idiot. I later returned closer to 1pm that day. 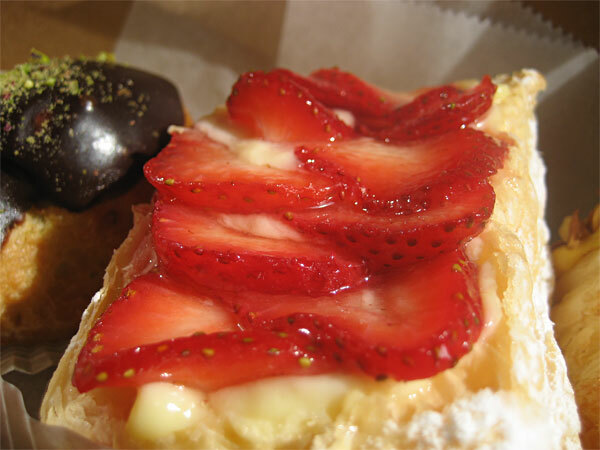 Just thought we could use some pictures of pastries from Pasticceria Natalina. Alas, I don't know how these taste, since they're a hostess gift. The thing in front has chocolate creme in it; the thing at right has (Velveeta-colored) banana mousse. The color is, indeed, a brightish orange. And what's more amazing, the combination of Velveeta and banana works marvelously well. Okay, okay. Just joking. No Velveeta. And I can't explain the color since the cases so entranced us that I neglected to ask for an explanation. But since I had no hostess gift to buy, I got to taste. And, well, golly: excellent. Superb, even. Wonderul pastry (as always) and even better filling. In light of PN's recent GNR nomination, I just wanted to add this quick note. This place rocks! 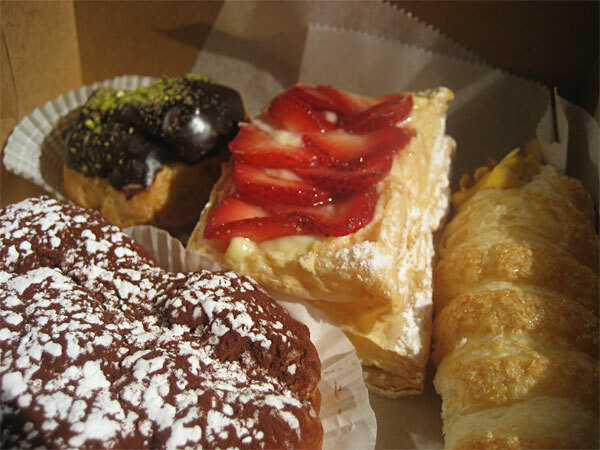 I went to Mike's Pastry Shop in Boston over Memorial Day weekend - wow can I say totally overrated! PN puts that place to shame. I can't believe how many people actually think Mike's is the best bakery in Boston. The sfogliatelle was awful - it totally tasted stale. I bought mine on early Tues morning. If that was baked fresh, how sad. PN' sfogliatelle was so much better - the layers are so much more delicate and flaky. Her filling is so tasty too. Also at Mike's, I picked up fig cookies, vanilla and pistachio torrone, and rainbow cookies. Since I went 3 mos ago, and didn't post, it was obviously nothing to write home about. I was embarassed to share my purchases when I returned b/c they were just awful. Anyway, back to PN, I love love love her pinenut loaf cake. It is so delicate in taste, but so addicting. It looks deceivingly plain, but it's so heavenly. Her chocolate croissaints are amazing - so flaky, buttery, and light - much better than Sweet Occasions' croissaints. Mike G -- you're an evil man. I was doing just fine without visiting Pasticceria Natalina...but after viewing your GORGEOUS photos, I found my bike wandering it's way over to it this morning....and I was sucked in like so much flotsam and jetsam in the river to carting home a box filled with lovely pastries. And I today i found some more savory packages of ricotta and prosciutto and one filled with fig and those incredible cherries and ricotta wrapped up in a delicious baked pastry. This place has definitely become one of the special places in this city. Natalie and her husband are simply artists. That pine nut loaf cake of hers, which she explained to me today was a close replica of a family recipe that had been lost (she apparently did a lot of research into it) is just one of the most delicate and wonderful tastes I've ever had in my mouth. I've expressed my views over on the GNR thread...but I can't seem to shut up about it. I'm polishing off a piece of that pine nut cake as I write this. Mmmmmm. Are they really Sicilian? Nick in particular looks more Arab, and Zarzour is definitely not an Italian name. Son of Souvlaki wrote: Are they really Sicilian? Nick in particular looks more Arab, and Zarzour is definitely not an Italian name. Natalie is the Italian member of the marriage, and if I recall correctly from Mike Nagrant's excellent interview with her and her husband, she was born in the US but spent many summers in Sicily. And yes, Nick is of Lebanese descent, and much of Natalie's training in making pastry was in Lebanon. Pasticceria Natalina has changed its hours of operation (I stopped by at 11 a.m. today to find it closed). Wednesday - Friday 12 p.m. to 11 p.m. I called tonight and learned that these are "summer hours," but Nick said, "It's been working so well that it might become permanent." I asked whether they're staying open to accommodate the post-dinner crowd, and he said yes. There's nothing at Pasticceria Natalina that doesn't bring me to my knees . . . it's just that good -- best bakery I have ever tried. The consistency and focus on perfection is amazing. Every pastry chef should be required to spend a little time at this place to understand just how good pastries can be. But until today, I had not tried their version of Cassata (I actually ordered the Cassatine . . . a miniature Cassata). This has always been one of my very favorite cakes. And while I've tried many versions and interpretations of Cassata, I have to say that Pasticceria Natalina's is by far the best version I have ever tried. Moist layers of cake, an amazing sheep's milk ricotta filling with orange zest and grated chocolate, and topped with marzipan. The fact that they go to such lengths to import the sheep's milk ricotta tells me everything I need to know about their dedication to perfection. I've made this dessert with cow's milk ricotta and while good, it's just not the same. So on top of all of the recommendations of Pasticceria Natalina menu items here, I urge you to try this Cassatine.